When it comes to spray foam insulation Phoenix, experience counts. Our installers have the training and experience to get your insulation project done right the first time. From attics to crawl spaces and in homes or commercial buildings, know that you will be getting the best insulation product on the market today, installed by highly trained foam technicians, and at a price that will make good sense for your budget. Call us today to schedule a complimentary assessment and quotation for your project. Foam insulation is not like other insulation types that can be installed by do-it-yourselfers, handymen or contractors “on the side”. It requires specific training to not only apply the foam in the most effective, time-saving way, but also to select the right foam formulation for your exact insulation installation. Tri-State installers use the best products on the market from the manufacturers with the newest technology. This ensures that you will get advanced insulation technology and a perfectly executed foam spray leading to the greatest energy cost savings possible. Our expertise extends to both new construction projects as well as retrofits in existing buildings. We work with contractors, homeowners and commercial building owners to achieve the optimal level of comfort for a structure’s occupants. Our selection of foam insulation even includes the most eco-friendly formulations available which are made from recycled products or soy. Newer foam formulations also use water or carbon dioxide as a blowing agent eliminating the need for hydrofluorocarbon chemicals which were prevalent in older closed cell foam formulations. One of the areas where you can enjoy the greatest energy savings and cost savings from spray foam insulation is in the attic. Even on the hottest Phoenix summer days when temperatures top 115° F., you can be comfortable inside. 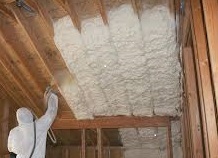 Foam insulation can be applied in either vented or unvented attic configurations. If your air handling equipment is located in your attic, then you will not only protect your living areas with attic spray foam, but you will also lessen the stress on your HVAC equipment. By enclosing the attic in a thermal envelope of spray foam, the attic and this equipment is now located in conditioned space which is much cooler on hot days than the outside air. Because spray foam helps reduce condensation, the metal parts on the air handling equipment won’t rust and need replacing as fast as they otherwise would have. Heat transfer from outdoors to indoors also can take place through walls. Having spray foam installed on exterior walls will stop the thermal transfer of heat. Foam insulation is also used effectively in the voids on cinder blocks or concrete blocks and effectively blocks heat transfer through these building materials. Spray foam is the best insulation for your project because it will save you the most on your energy costs while creating more comfortable spaces inside. In the Phoenix area, savings of up to 50% per month can be experienced. It can effectively block the penetration of dust, allergens and pollution into indoor spaces while it seals up holes and crevices used by pests to gain entry. Give us a call today to see how much spray foam can save you in energy costs each month and how much more comfortable you can be indoors with professional spray foam insulation installation. Copyright @ www.tri-state-foam.com | All Rights Reserved.